A win next week will earn Ephie Fitzgerald’s side a place among the final four. Eimear Scally of Cork in action against Treasa Doherty of Donegal. GALWAY SECURED THEIR place in the Lidl National Football League Division 1 semi-finals after round five of the competition, while Dublin, Donegal, Cork and Mayo can still earn a semi-final spot after the weekend’s results. 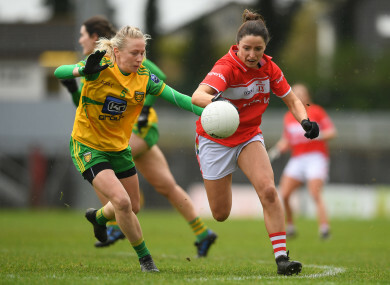 Ephie Fitzgerald’s Cork side delivered their best performance of 2019 as they romped to a 3-16 to 0-4 win against Maxi Curran’s previously unbeaten Donegal, and a win next weekend against Mayo will wrap up their spot in the last four. Goals from Ciara O’Sullivan, Niamh Cotter and Ashling Hutchings put Cork on the road to victory at Pairc Ui Rinn on Saturday, while Orla Finn’s six points ensured an easy day for the Rebels. All four of Donegal’s points came from Karen Guthrie frees. After the weekend Galway are now the only unbeaten team in the top flight as Tim Rabbitte’s side were made to work hard for their five-point win over Tipperary in Bansha. With Tracey Leonard on form from placed balls and open play Galway built on their three-point interval lead, and when Moloney fired her second goal late on there was no hauling back Galway. Peter Leahy’s Mayo are still in with a slim chance of making the last four after they edged a three-point win against Westmeath. First-half goals from Sinead Cafferkey, Tamara O’Connor and Fiona Doherty gave the westerners a comfortable lead, but they were pushed all the way by the home side at St Loman’s. Mayo ned to win their remaining games against Cork and Dublin to reach the semis. TG4 All-Ireland championship and Lidl national league champions Dublin showed they are in the form to claim more silverware as Sinead Aherne marked her first start of the season with a hat-trick of goals in victory against Monaghan. Last year’s Footballer of the Year looked very sharp as Mick Bohan’s side picked up their fourth win of the campaign to move within a point of a spot in the semi-finals. Siobhan Woods, Siobhan Killeen and Aherne’s treble meant Dublin were 5-7 to 1-6 up at half-time – Ciara McAnespie bagged Monaghan’s goal – while Leane Maguire’s penalty helped Monaghan recover somewhat after the restart. Monaghan face Tipperary in a key relegation battle next weekend, while Westmeath will look to pick up points against Donegal and Tipp in their final two games to retain their top flight slot. Meanwhile in Division 2, Armagh had four points to spare against Clare as the Orchard girls maintained their 100 per cent start to the season, while Waterford claimed a hugely significant win over Tyrone, with Maria Delahunty’s second-half goal proving decisive as the Deise boosted their promotion hopes. The meeting of Kerry and Cavan was postponed due to a bereavement, while Wexford remain in the hunt for a semi-final place after their one-point win over Laois. In Division 3 Meath picked up their fifth win in a row, this time a one-point victory away to Kildare, while Longford and Sligo both earned wins against Down and Roscommon respectively. Wicklow turned on the style and hit five goals past Offaly as they put their hand up for Division 2 football next season. In Division 4 the tight battle for promotion continues with wins for Limerick and Carlow. Derry and Antrim drew, while the Louth versus Fermanagh game was postponed due to an unplayable pitch. Email “Galway secure league semi-final berth, while Rebel revival keeps Cork in the hunt”. Feedback on “Galway secure league semi-final berth, while Rebel revival keeps Cork in the hunt”.